In April 2012, I wrote a blog post arguing that UK planning policy for the countryside has generally emphasised landscape and biodiversity conservation over and above economic and social objectives. I suggested that, tacitly, national and local planning policy has conserved that rather British idea of well tended countryside with picturesque villages – a bucolic ideal which might sound timeless, but is in reality a twentieth century construct. As I wrote at the time, I’m not sure this vision of the countryside is an entirely helpful one for the future. As EU farming subsidies wane and fuel costs increase, do we not need to plan for new ways of our countryside being more productive and a place to invest and innovate, as it was during the heyday of the eighteenth century Agricultural Revolution? Or, to put it in modern policy-speak, should we not plan for the countryside to make a fuller contribution to the Scottish Government’s objective of sustainable economic growth? What that post didn’t do was offer suggestions on how a new generation of rural planning policy might actually achieve that. This post aims to put that right. Since writing the original post, I’ve had the opportunity to look in more detail at rural planning policies put forward by a few Scottish local authorities. With help from my colleague Richard Heggie of Urban Animation, I’ve put together a few thoughts on how rural planning policy could better recognise the strategic importance of the countryside and contribute to strengthening local communities. These ideas were developed as input for one particular local authority’s Main Issues Report, but I think they’re worth sharing for other local and national rural policymakers. Obviously they’ll need to be tailored to local circumstance, but I hope there will be some ideas worthy of wider application. First and foremost, I believe that Main Issues Reports for rural local authorities should contain a dedicated section on rural communities and their important contribution to sustainable economic growth and strengthening communities. Main Issues Reports could clearly spell out their intention to maximise the potential of the rural area for residents, businesses and visitors by encouraging rural enterprise in support of the sustainable economic growth – linking with the local authority’s economic development strategy, Community Plan and Single Outcome Agreement. Main Issues Reports might also spell out other rural objectives, which could include supporting sustainable communities, affordable housing and favouring new development in and around existing settlements and building clusters rather than in the open countryside. “apply the land use elements of the Community Plan and other Council and Government strategies into an overall spatial plan for the local area providing a means to join up messages about place and delivery” (paragraph 6). This point about positive language is more than just semantics. It’s about sending a positive signal to rural businesses and investors that development will be welcomed – provided that is appropriate, which I will come to below. The next thing that Main Issues Reports need to do is map out the Council’s preferred spatial strategy for rural development. Obviously, it should be designed specifically to deliver the objectives outlined above. Most of Scotland’s rural planning authorities promote spatial strategies which focus new rural development in and around existing settlements. Some, such as Highland, Argyll & Bute and Moray, identify very small rural settlements which don’t even amount to villages in terms of their scale or the services and facilities they provide. For example, the Moray MIR makes clear that its preferred approach is to “promote rural communities as a preferred location for development, that will consolidate existing groupings and servicing costs… in preference to development in open countryside”. Maximise the rural area’s contribution to sustainable economic growth, recognising that the countryside often has growth potential that complements demand from nearby urban areas in agriculture, minerals, renewable energy and tourism/recreation. Strengthen rural communities through appropriately scaled, designed and phased business and residential development, coupled with joined-up policymaking that integrates Community Planning and spatial planning. Conserve natural resources and assets. Achieve a good standard of design. In order to implement their preferred spatial strategy, Main Issues Reports could then put forward a number of planning policy options for development (1) in and around settlements and (2) in the wider countryside. Continue with the current format i.e. rural communities with identified development sites. There may be a need to cast the net more widely than land suggested at the Call for Sites stage, to consider other sites which may be appropriate for development but have simply not been put forward by landowners during the Call for Sites. It is a fact that many good sites are simply not put forward by their owners. No boundaries around rural communities, but permit development which abuts/joins the boundary of an existing property subject to a limit of (say) no more than a 25% increase in houses over the plan period. Effectively the approach would move from defining SITES that can be developed (the existing approach) to specifically defining land that cannot be developed whilst providing flexibility in where new development may take place. This option was put forward in the Moray MIR, for example. New development would need to satisfy a number of criteria, such as in the Highland-wide LDP. Ideally, this should be accompanied by plans which show un-developable land or undesirable areas for development (e.g. because of flooding, biodiversity designations, archaeology or landscape quality), although this is likely to have resource implications for local authorities. Create a masterplan for each village which identifies a long term vision for the community, a spatial plan for future land use/development and an action plan for other future investment and change. This should be prepared collaboratively with the involvement of the local community, Council planners, other departments and Community Planning partners. This kind of village masterplanning approach has been used by successfully by planning authorities in Orkney, Loch Lomond & the Trossachs National Park and the Cairngorms National Park for example. There would be a resource requirement for local authorities but it should be possible (and desirable) to integrate with increasingly place-based Community Planning initiatives to develop a coherent spatial strategy as the Scottish Government suggests. Preparation of village masterplans could be phased over a period of time to prioritise ‘areas of change’ requiring either regeneration or development restraint. Restrict new development outwith rural settlements to conversion/refurbishment of existing buildings or where there is demonstrated business need, etc. This is likely to be the ‘do nothing’ scenario for many local authorities. Encourage new development alongside existing clusters of buildings, such as in the Highland-wide Development Plan, Scottish Borders Proposed LDP and the Isle of Gigha Masterplan (which contains more detailed design guidance). 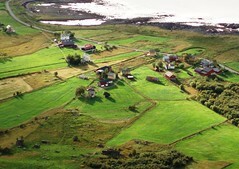 Require all development proposals in the countryside to explain how they will contribute to sustainable economic growth and strengthen rural communities (NB for all but the largest proposals, this should not need professional assistance; it should simply outline the benefits to the local economy from the construction and operation of the proposal, e.g. through employment of a local builder, supporting the local school or a rural business, creating new rural workspace). Support new development that contributes to the local authority’s strategic objectives for the countryside – e.g. permanent employment, affordable housing or the renovation of traditional buildings. This is worthy of specific attention. There may well be a greater role for enabling development than in previous decades. Many traditional rural buildings have now been refurbished, encouraged in no small part by a combination of planning policy and market demand (at least until 2008). Traditional rural buildings which remain (and others which become disused in the future) are likely to be expensive, difficult or unattractive to refurbish and may require cross-subsidy. New development may help to deliver affordable rural housing or workspace which would otherwise not be built. There is an opportunity to shape planning policy to delivery the kind of rural development that local authorities would like to encourage, for example by favouring new build proposals which consolidate existing building groups, whilst also providing benefits such as affordable homes or workspace. Main Issues Report could introduce this principle, with detailed policy brought forward at the Proposed LDP stage. I’d be very interested to hear how workable you think these ideas might be; any pitfalls; and if they stimulate you to think of other things… comments are welcome!